High on the list of words I never thought I would write in 2015? How about something along the lines of proclaiming a sequel/spinoff to 1976 Academy Award-winner Rocky, a movie that’s already had five proper sequels, one of the year’s best motion pictures? Yeah. Can’t say I saw that one coming, either. 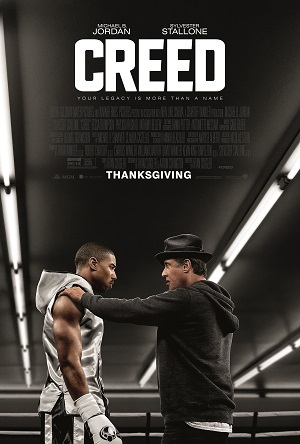 But that’s exactly what writer/director Ryan Coogler’s Creed is, a movie that both embraces the ideas and themes from Sylvester Stallone’s enduring series while also bravely and dynamically forges its own unique path. It’s darn near perfect, the film an entertainment knockout for every single one of its 132 breathlessly paced minutes. 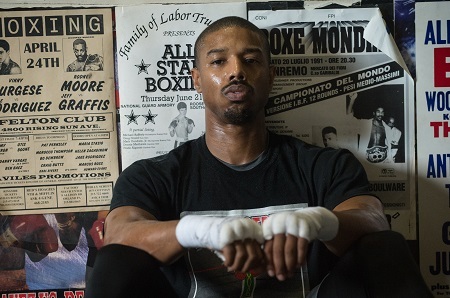 Adonis Johnson (Michael B. Jordan) has come to Philadelphia looking for someone from a past he does not know. He is the illegitimate son of former heavyweight champion Apollo Creed, a boxing legend who died before he was born. Plucked out of foster care by Apollo’s widow Mary Anne (Phylicia Rashad), raised to be a thinker, not a stinker, Adonis nonetheless finds himself compelled to follow in the footsteps of a father he never met. Now he’s in Philly to meet the one man he thinks can help him realize his dreams of boxing stardom, help him find that proverbial eye of the tiger; former heavyweight champion of the world Rocky Balboa (Stallone). There’s not a ton more to say plot-wise as far as Creed is concerned. Similarities to Rocky are obvious, and as such figuring out where Adonis is going to go, uncovering the fights he is going to find himself a part of, none of this is particularly surprising. It’s how Coogler gets there, how he crafts the central relationships that is most interesting, using the same grounded, down to earth philosophy that he utilized so effectively with Fruitvale Station for all of the goings on here. Simply put, Adonis is just a terrific character. 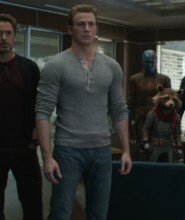 His pain is real. His longing to know who he is, how he belongs, what it means to have a father who was a superstar to millions yet at the same time left him and his birth mother with nothing, all of these aspects to his persona feel genuine. This is an underdog story that hits all the requisite beats yet also knows it can’t take place in the same world as the original did. But, at the same time, it still respects it, finding the commonalities between then and now, playing things close to the vest in ways that are honest, heartfelt and true. The performances are tremendous. 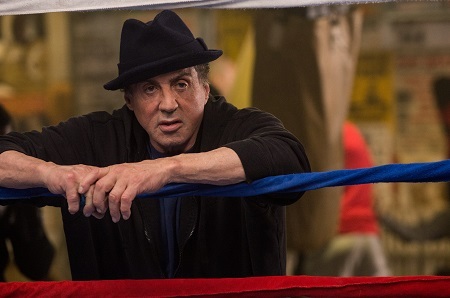 Stallone will arguably get the most press, and I’ll go out on a limb and state he’s likely going to get a Best Supporting Actor Oscar nomination for his seventh turn as Rocky, and by golly if he doesn’t deserve the great majority of it. His best performance since Cop Land, maybe since First Blood, potentially since the original Rocky, the veteran action superstar throws himself into this body and soul, tackling the trickier sides of Coogler and fellow writer Aaron Covington’s script with invigorating gusto. He finds depths to the character we’ve never seen before, and I was honestly moved to tears during one pivotal moment where Rocky talks about all he’s lost along the way to becoming a living legend and sports icon. Thing is, as superb as Stallone is, and he is amazing, I worry that what’s going to be lost in all the sound and fury is just how fantastic Jordan is. For all who thought he was robbed an Oscar nod for Fruitvale Station, get ready to get your dander up once again, because he’s even better here, and likely, once again, to have almost no shot to be considered for a Best Actor nomination. His work as Adonis is stunning. The way he interacts with Stallone. The delicate, naturalistic way he falls into love with the lovely up-and-coming singer living in his apartment complex (memorably portrayed by a dazzling Tessa Thompson). The emotional complexities oozing out of his early conversations with Rashad. How he internalizes his psychological misgiving around embracing his father’s name while still forging his own, individualistic way forward. Jordan encapsulates all of this and more magnificently, not only physically transforming into Adonis, but inhabiting him spiritually as well. The technical facets are equally glorious. 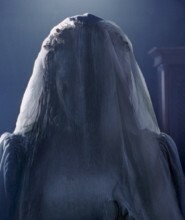 About halfway through Coogler and cinematographer Maryse Alberti (The Visit) stage the first major bout with Adonis, the first full two rounds of which, including the corner break, are showcased in one glorious take, the camera bobbing and gliding through the punches effortlessly. The pair’s staging of the climactic bout, one I should not have to explain the stakes of to anyone who has ever seen a single minute of any of the six previous Rocky movies, is brilliantly realized, achieving a you-are-there verisimilitude that’s wonderful. There are delicate grace notes recalling all the previous adventures, most noticeably in how Ludwig Göransson’s (Top Five) rousing, energetic score subtly evokes many of Bill Conti’s more recognizable themes, yet never does so in ways that could be considered heavy-handed or intrusive. I also love the gentle nod to 2006’s Rocky Balboa as it pertains to the cemetery where Adrian was laid to rest, now joined by her brother Paulie, while other little snippets toying with both Rocky and Rocky II training montages are an absolute treat. But the core remains the characters themselves. Coogler never loses sight of this, does not allow affinity for the previous sequels or an inherent knowledge of sports film clichés get in the way. Adonis and Rocky make one of the year’s best cinematic pairings, their transition from strangers to acquaintances to partners to friends to something so much more absolutely exquisite. 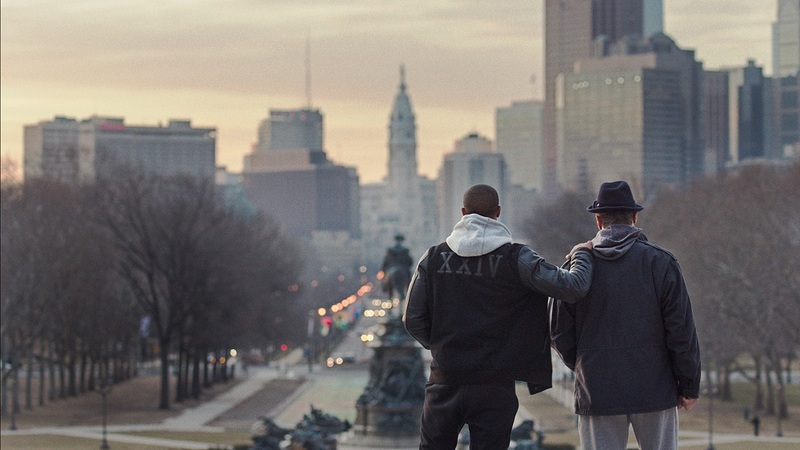 The final scenes atop some familiar Philadelphia Museum of Art steps are the ideal coda to a new underdog story that by all rights shouldn’t be this magnificent, Coogler’s Creed a thunderous success that doesn’t just fly, it positively soars.